LapLink Gold 11.0 is the latest release of this award-winning, robust all-in-one communication solution. Now you'll have the ease of quick access to a desktop PC to tap into all of your network resources; access files; synchronize data between PCs; run database applications; operate, maintain and even reboot PCs or servers; send and retrieve files remotely via an Internet browser using the new Surf Up feature - you can do it all remotely with this single application! 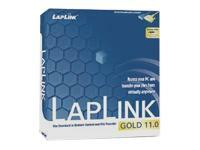 LapLink Gold 11.0 ensures an easy, safe and reliable way to connect to your office or other remote computers to run any desktop application. Control access to your PC's drives and folders with Folder-Level Security. Protect your data during transmissions with Multi-Level Encryption. Thwart repeated attempts guess your password with Case-Sensitive Passwords and Lockout Protection. Use the Address Book to build an Access Control List for those with permission to access your PC. Enjoy lightning-fast transfers of any file type with the patented SpeedSync technology that transmits just the updated portion of files. Use SmartXchange to instantly synchronize multiple folders without complex scripting. You can tap into network resources by using a remote control connection to a networked PC, access all PC's local and network drives with a simple file-transfer connection and print items stored on your home PC on your office printer, or vice versa, with two-way print redirection.